Aculon® NanoClear® SMT Stencil Treatment is the world’s premier stencil coating. 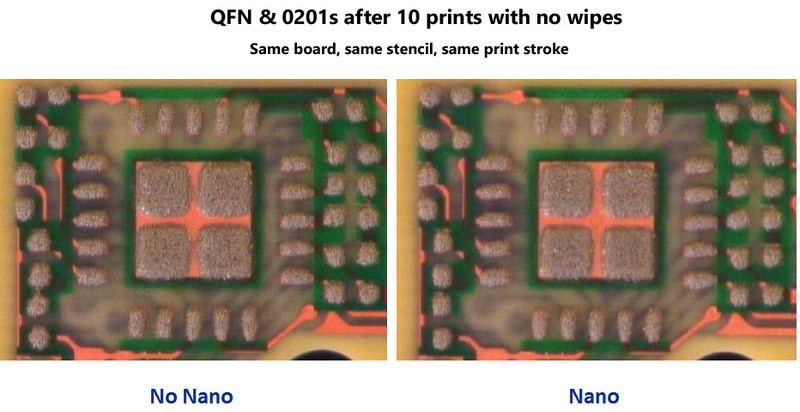 NanoClear® will improve print quality, increase throughput, reduce defects and enhance printing with small apertures. As the creator and #1 global leader in the stencil nanocoating category, we are excited to share this recent article from the February 2018 edition of SMT007, covering a recent interview between Aculon Chairman and CEO Edward Hughes and Stephen Las Marias. The article “Exceeding Customer Expectations,” gives readers an inside look into how Aculon® addresses and overcomes customer challenges in order to ensure customer satisfaction with the NanoClear® and NanoProof® product series. Aculon®, an award-winning & proven supplier to the stencil industry, introduces Aculon® NanoClear®, the best-in-class stencil treatment technology that improves print quality, increases efficiency, lowers total costs and enhances printing with small apertures. Faster release and improved print resolution is achieved as the paste is more easily released from the aperture walls due to the fluxophobic nature of the treatment. 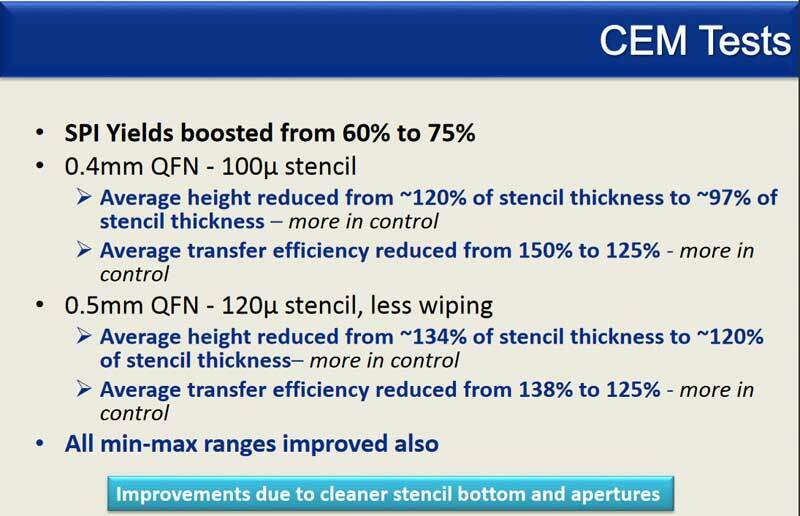 The Aculon® NanoClear® Stencil treatments are now 50% stronger due to a greater concentration. 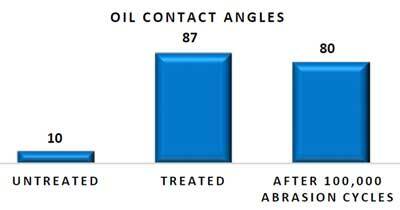 As can be seen from the contact angle graph, a treated stencil is 8 times more oil repellent than an untreated stencil even after 100,000 abrasion cycles. Independent testing proves that NanoClear® offers best-in-class durable performance. 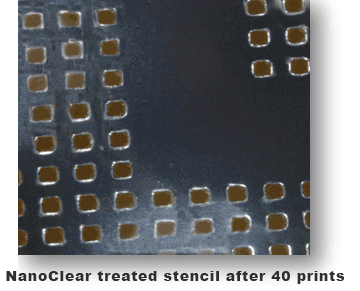 The ability of a stencil treated with NanoClear® far outperforms the initial performance of all competitive materials. 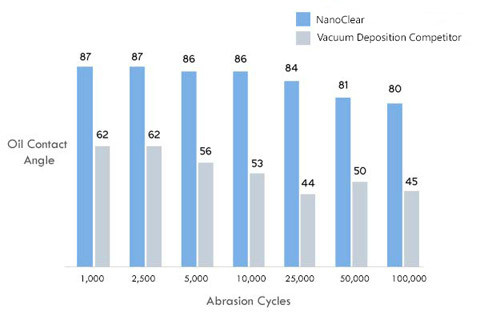 NanoClear’s ability to repel flux is maintained for over 100,000 abrasion cycles after treatment, while the performance of a well-known vacuum applied competitive material quickly falls off after 5000 abrasion cycles from an already weak, barely fluxophobic starting point. Download the Zestron Compatibility Test Report Here!The NanoClear® treatment was found to be compatible with ZESTRON’s MPC® Technology based VIGON® SC200 (pH neutral), VIGON® SC202 (pH alkaline), solvent based ZESTRON® SD301 and ZESTRON® SD100, & VIGON® SC210 during the above compatibility testing. There was no delamination or discoloration observed after exposure. There was minimal degradation in the fluxophobic performance of the NanoClear® treatment with highly repellent Water contact angles of 110 degrees and oil contact angles of 60 degrees. The better quality printing is due to the reduction in bridging as the flux is now repelled from the aperture walls. Tests have shown that treated stencils show significantly reduced the cleaning cycle frequency resulting in both improved print quality and better manufacturing efficiency. Chrys Shea, President of Shea Engineering Services, an expert in Surface Mount Technologies. Jimmy Crow, SMT Process Engineer, Rauland-Borg. This webinar will focus on a real life success story of how Jimmy Crow, Senior Project Engineer at Rauland-Borg used NanoClear® as part of a SMT Stencil Improvement program to deliver spectacular results. Chrys Shea, an independent SMT expert will interview Jimmy Crow to discuss the program and the results. This FREE webinar explains why leading OEMs and CEMs are adopting stencil nanocoating technology to improve quality, enhance productivity and reduce costs and this webinar will share the data to back the claims! This FREE webinar covers the recent release of Aculon® NanoClear® Technical Bulletin Series. 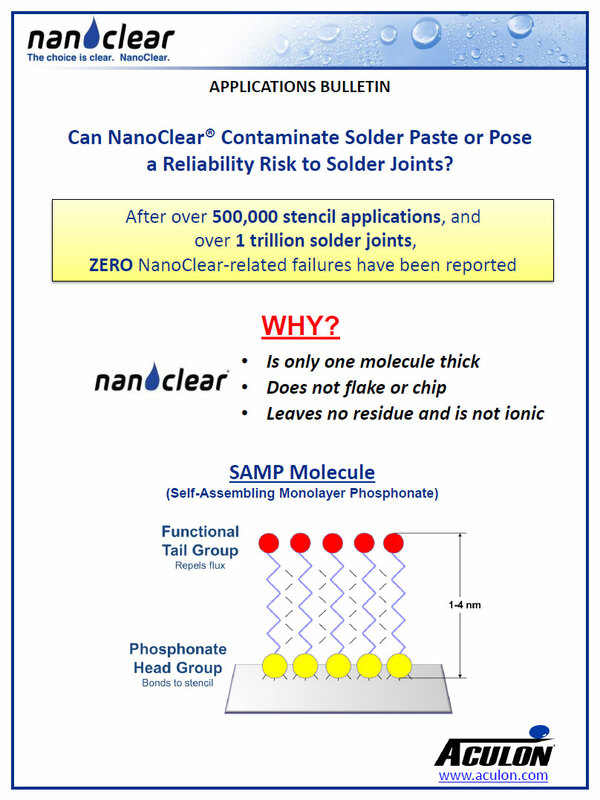 The Nanoclear® Technical Bulletin Series are designed to succinctly summarize explanations to several of the most common questions and concerns about utilizing NanoClear®. Click below to download the NanoClear® Technical Bulletins. 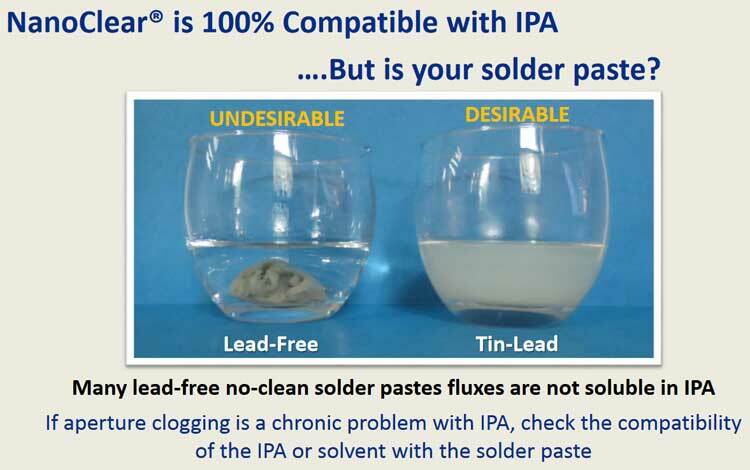 Can NanoClear Contaminate My Solder Paste or Solder Joint? Does NanoClear Coat the Aperture Walls? How Can I Demonstrate NanoClear’s Cost Savings? How Can I Further Improve My Print Process? How Can I Tell If NanoClear Is Still Effective? 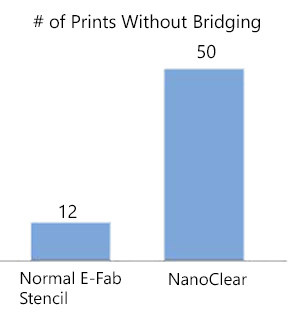 How Does NanoClear Improve Print Quality? 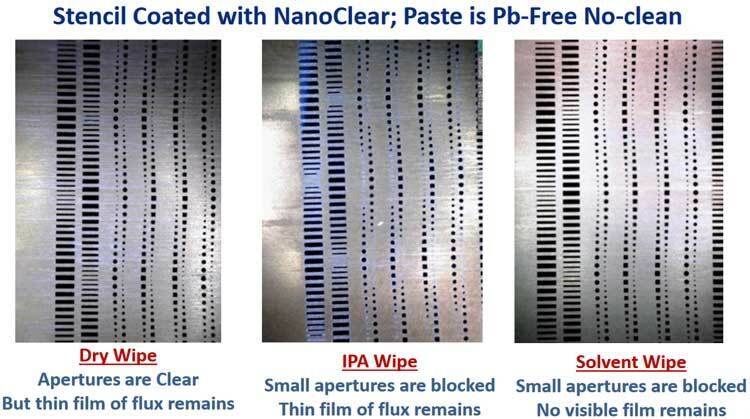 How Will My Process Benefit from NanoClear? 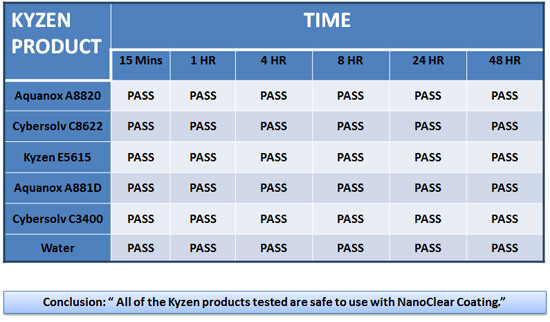 How Long Does NanoClear Last? Transfer Efficiency or Transfer Effectiveness? How Do I Apply Statistics to Print Quality? What is the Difference Between Wipe-On and Spray-On NanoCoatings? 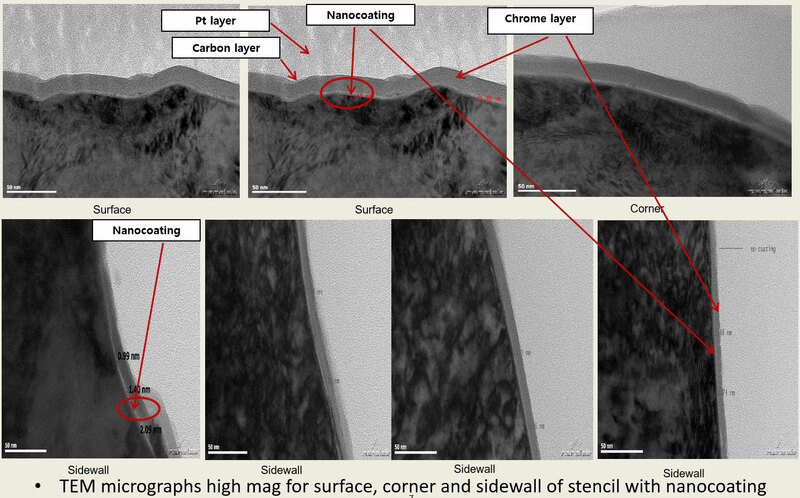 Why Use Softer Wipe Material on NanoCoatings? Hughes, Aculon® CEO and Chairman, discusses Rauland as the focus of the case study, demonstrating a business benefiting from the significant reduction in costs and increased efficiency by switching to NanoClear® SMT products. Rauland-Borg, an 80-year integrated communications technology company that builds nurses call stations and school bell systems. 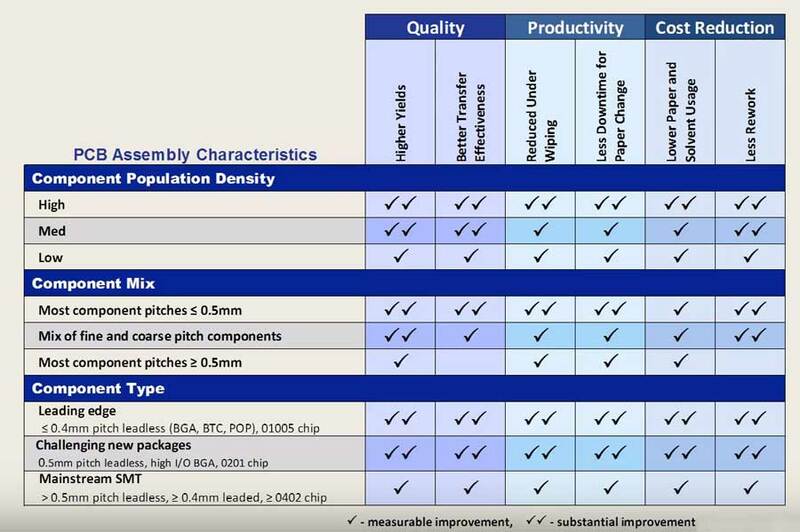 Rauland runs a factory that builds four- to eight-layer PCBs, replaces BGA, CBGA, QFNs, typical double-sided boards, with their smallest part to date an 042-Aperio. Rauland’s SMT Engineer, Jimmy Crowe, embarked on an SMT improvement process, eventually discovering NanoClear®. Rauland is an American manufacturing company based in Mount Prospect, Illinois that produces workflow and life-safety solutions for hospitals and schools worldwide. Rauland is a division of AMETEK Inc., a leading global manufacturer of electronic instruments and electromechanical devices with manufacturing, sales and service locations across the United States and other countries throughout the world. Today, Rauland responds to market needs worldwide with two distinct communication system product lines: Responder, designed for the healthcare industry and Telecenter systems which serve the educational market. As with many electronics manufacturers printing with SMT equipment, Rauland was experiencing a high number of defects related to the printing process. Jimmy Crow, an SMT Process Engineer at Rauland, was tasked with identifying the problem and determining the best options to help the company reduce defects, and thus, save money. Jimmy learned from previous studies that 65% of defects on an SMT line are a result of the screen printing process. Jimmy decided to troubleshoot the printing process using a systemic approach to root out the problem areas on the line. The method used was a “trifecta” of solutions, changing three key elements. After converting to a new wipe material and ceasing usage of IPA in favor of Zestron Vigon, Jimmy still wasn’t seeing the target results. 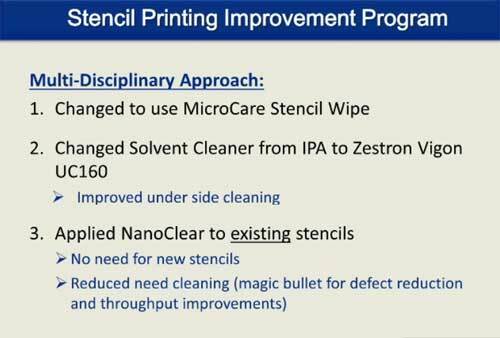 The “magic bullet” in Rauland’s process was Aculon’s NanoClear® Stencil Treatments. 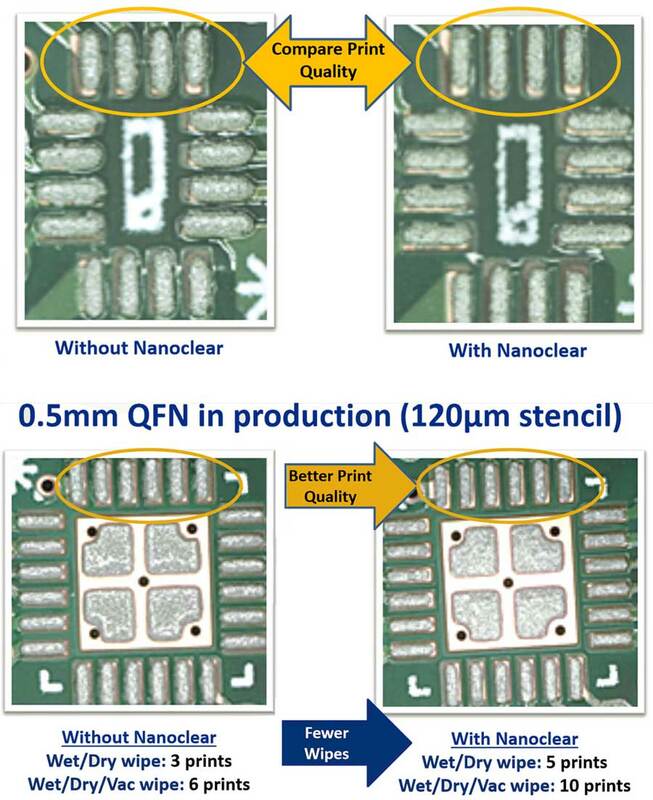 By treating the stencil with NanoClear®, the stencil becomes fluxophobic and repels solder paste much faster, improving print quality and reducing cleaning intervals. This three dimensional approach yielded staggering results for Rauland’s SMT line. Instead of wiping every 4-6 cycles as normal, they were able to extend wipe intervals to around 25 cycles for many of their products! This added process efficiency freed up 8 seconds per board, an incredible 35% throughput increase. It wasn’t just a throughput increase that Rauland found after implementing their new SMT program. 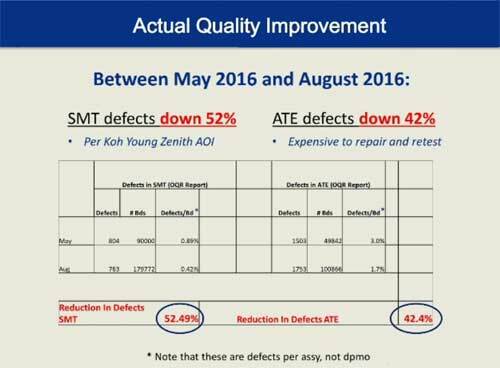 Within 3 months, SMT defects had dropped by over 50% and ATE defects had declined by over 42%. There is the old adage: services can be cheap, quick, and high quality. Combined, only two of those three are possible. Rauland’s SMT printing process has identified the way to have all three. By wiping at increased intervals, the process is faster and more efficient. By reducing defects, consistency in quality has improved, saving additional costs. Powered by Aculon’s NanoClear® Stencil Treatment, Jimmy Crow and Rauland have provided a great model that all SMT printers can mimic for fantastic results in their printing processes. 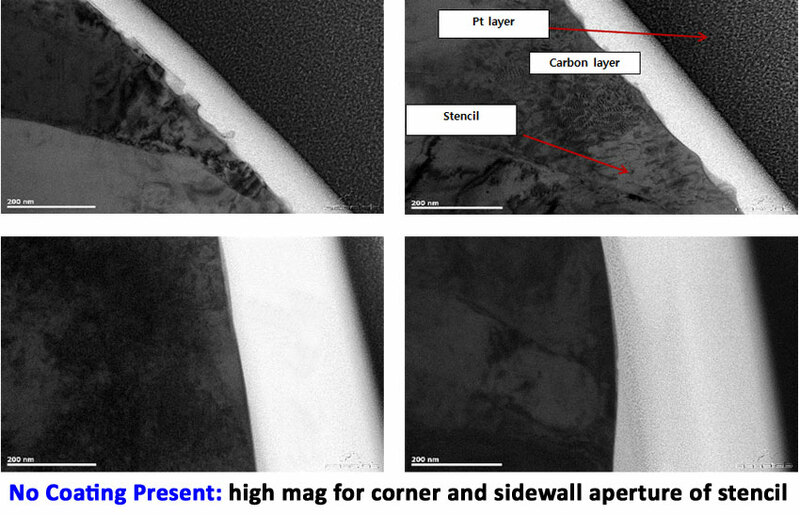 In order to quantitatively prove that Aculon® does coat the aperture walls, Aculon® recently conducted TEM analyses on a range of stencil samples. As you can see from the results, NanoClear® successfully coats the aperture walls! 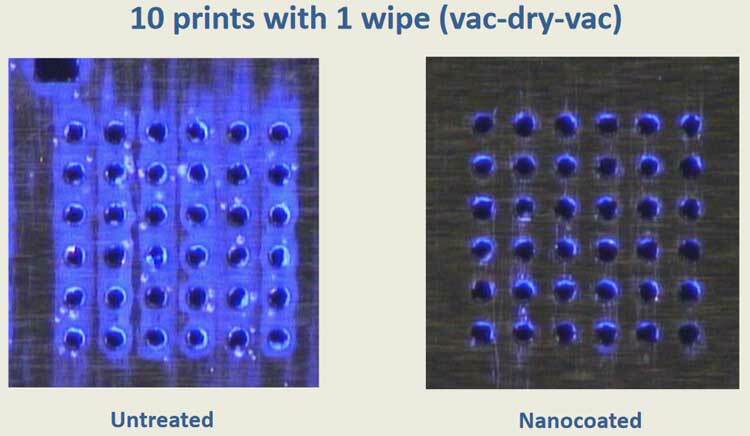 Nanocoating on stencil after 15,000 printed: 5,000 cleaned by auto wiper with solvent. A thin layer of chrome is sputtered onto the surface of the stencil in order to be able to distinguish coating layer and the stencil. C-based sharpie ink coating and then Pt coating – both to protect the sample from charging during sample preparation process. 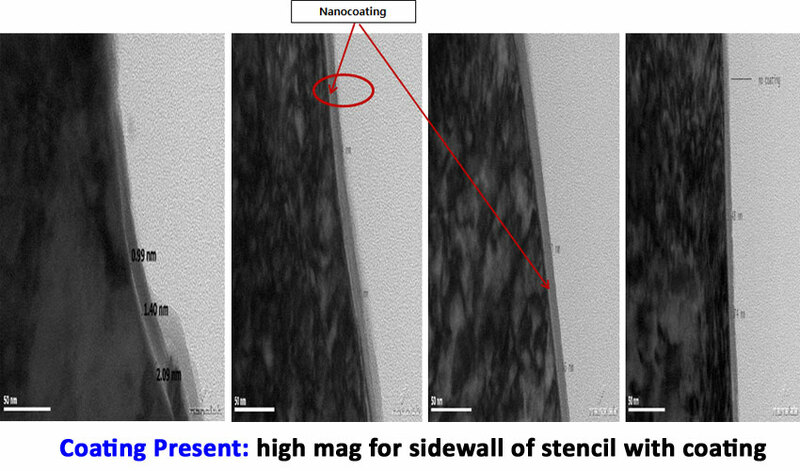 Stencil with nanocoating: Nanocoating was detected with thickness ranging from 0.99nm to 4.76nm. 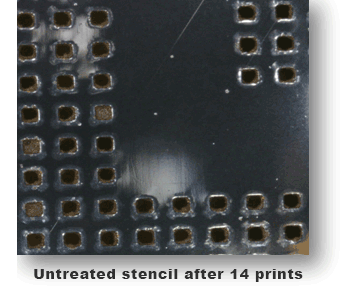 Stencil with nanocoating after 15,000 printed (5,000 cleaned by auto wiper with solvent): Nanocoating remained intact. However, there appears to be a buildup of solder paste/contamination beneath the chrome layer that was not present before. Due to a lack of cleaning solder paste / contamination has essentially overwhelmed the nanocoating as material has built up on top of it. The cost of ownership calculator will help you determine how much cost savings you will enjoy by using NanoClear®. Aculon recently conducted abrasion durability testing pitting NanoClear® vs FCT-MicroShield OC-1500®. The test featured 750 grams of added weight and 4 layers of DEK UFP ECO® Roll or 4 layers of Green Monster® for each stencil coating. DEK ECO® and Green Monster® are 2 types of abrasion rolls that are designed to mimic a constant wipe application to a coated substrate. This is done to determine how long the coating lasts, and what repellent properties still exist after constant abrasion. 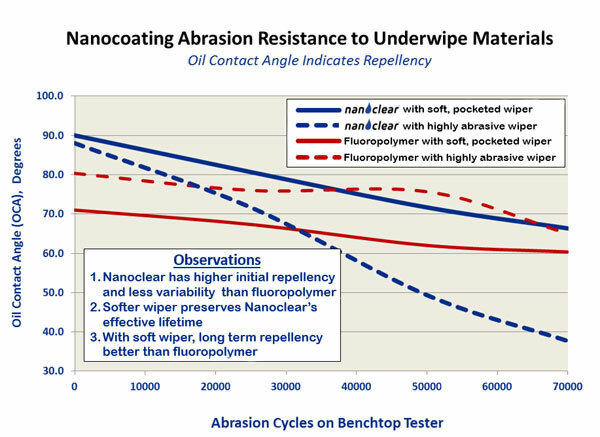 As the above graph illustrates, NanoClear® significantly outperformed the MicroShield® in resistance to abrasions. With the DEK ECO® Roll, NanoClear® never reached contact angle failure threshold after 70,000 abrasions. MicroShield® reached failure threshold around 18,000 abrasions. With Green Monster®, NanoClear® failed after 38,000 abrasions, while MicroShield® failed after around 15,000 abrasions.